* Black-box, top-down definition: system then hardware, software, etc. * Overall system behavior, functionality, performance, and quality are a result of the interactions of the parts that make up the system. * Interactions between the parts result in interfaces, which must be identified, defined, documented (interface requirements), and closely managed. Read more about interfaces here. * Embedded software is not the same as application software development, embedded software interacts not only with the operators, but also other embedded software and system sensors. * Done mix build-to “how” requirements with the design-to “what” requirements. 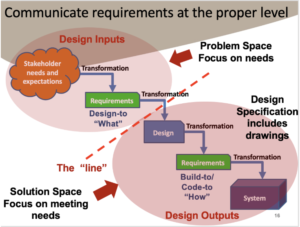 * Keep design-to, “what” requirements “above the line” and build-to, “how” requirements “below the line”. * Check out my blog here to learn more about flowdown (allocation) of requirements and traceability. * Requirements are the common thread that ties all lifecycle activities and artifacts together. * The success of a project is dependent on the quality of the requirements. * Learn more about risks and requirements on my blog here. * Define scope and stakeholder needs before developing requirements. Learn more Delivering Quality Products here. * Identify a feasible concept before developing requirements. Learn more about Concept Maturity Levels here. * Writing requirements is not an exercise in writing, but an exercise in systems engineering. * Requirements must have an underlying data and information model from which they are derived. 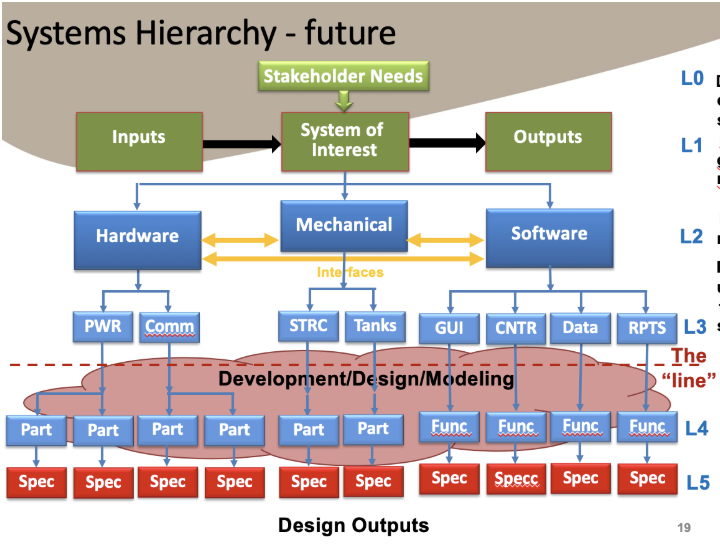 Learn more Integrated Data and the Foundation of Systems Engineering here. * Use modeling/diagrams to help ensure completeness, consistency, and correctness of stakeholder needs and resulting requirements transformed from those needs. 7. A requirement statement is the result of a formal transformation of one or more needs into an agreed-to obligation for an entity to perform some function or possess some quality (within specified constraints). 8. Use the INCOSE Guide for Writing Requirements. * This will help ensure requirements are well-formed having the characteristic that result from following the rules defined in the Guide. 9. Use the requirement attributes defined in the INCOSE Guide. * This will help you to better manage both your requirements and your project. * This will help manage not only the requirements but all artifacts developed across all life cycle activities. * Everything you want to know about interfaces but were afraid to ask.